By now I am sure many of you have seen at least one person using a 'selfie stick' and this fad keeps extending (not sorry for the pun). For those of you who have no clue what I am talking about, a selfie stick is an extendable, hand held monopod for your phone or camera which allows you to take a picture of yourself (selfie) from a distance or from an obscure angle without engaging a stranger to take the picture for you. If you still don't get it, here is a picture. The selfie stick has grown in popularity to the point that it has become a nuisance in certain places. Disneyland, The Kentucky Derby, and even the entire country of China have banned the use of selfie sticks, although China still allows their children to manufacture them. Many museums have also banned Selfie Sticks claiming that there is a risk of damage to exhibits and other patrons these extendable hazards. Many British soccer stadiums have also banned selfie sticks on the grounds that they can be used as deliberate weapons. "In essence you have a telescopic baton not unlike those used by riot police for non lethal crowd control," said a Premier League spokesperson, "Except this one has an iPhone on the end of it. 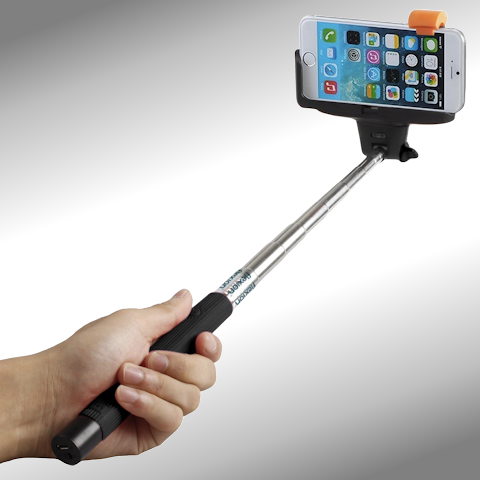 The potential for weaponizing these items means that we cannot allow Selfie Sticks into our football stadia." I agree that these things can be hazardous to innocent parties when a hapless or ignorant selfie taker moves suddenly, whipping their phone on a stick around at the peril of passers by, but the real concern is what else these Selfie Sticks could potentially be used for. Personally I prefer the term extendable or telescoping monopods because to me, a selfie stick is that special friend that you keep hidden in a shoe box under your bed, along with a couple of spare batteries and tube of Astroglide. What do you think of Selfie Sticks (either definition)? Share your thoughts, experiences and selfies in the comments section below.